I go (went) to a state school (and/or have an otherwise non-traditional, non-target background). How can I break into value investing? I’m not sure why I get so many of these questions – I imagine partially because there’s simply a lot of people out there with this question, and partially because I, through what can honestly only be dimensionalized as extraordinary brazenness combined with extraordinary luck – started working as an analyst at a hedge fund when I was 19 with no real formal financial education, which for some weird reason makes people think I’m uniquely qualified to opine on this topic (I’m not). With the caveat that I only have one person’s perspective from what can honestly only be called (charitably) the very fringes of the industry, I do, at least, have more insight than 19-year-old-me did, and have more time / willingness to share that insight than most people who get the occasional cold email on the topic. Rather than answer this over and over again in individual conversations, I’m answering it once and for all here. Some of this may be basic/redundant while some of it may be new; hopefully it proves helpful on the whole. Any reasonable discussion of this topic has to start with a clear understanding of not only the observable facts, but the drivers that underlie those facts. I’m just the messenger; I don’t necessarily agree that all these things are justified – but they are what they are. One of the weird things about investment management as an industry is that you can read about plenty of old guys who had terrible GPAs and unremarkable resumes who are now managing silly amounts of money… in fact, you can even meet plenty of guys who meet that description. And yet at the same time, it can feel nearly impossible for someone just out of college, with (comparatively) a solid resume, to break into the industry. A brief history discussion is justified (and mind you, this is all super high level, I’m not exactly an expert): once upon a time (before we were born), investment management was not really looked upon as the sort of prestigious industry that you would go into to earn fame and fortune. Then people started figuring out why Warren Buffett and company were so wealthy, and all of a sudden there was an explosion to either get into the industry, or get your assets into the industry behind some of these smart people (no matter the fee structure). Throw in a lengthy period of extremely favorable markets, and the market boomed. What happened? Well, at some point, the proliferation of players and democratization of information drove down available excess returns, making the market more efficient (as you would expect, mathematically speaking). This led to a transition: as you are undoubtedly aware unless you live under a rock, the trend du jour is firmly in the direction of indexing, “smart beta,” quantitative, and other lower-fee products. But looking in the rearview mirror at what the industry used to be like (as told by romanticized books and biographies) – or, even looking at what compensation structures look like today (which is not what they will look like tomorrow) – there are still tons of people who want to exploit the still-wide gap between return-on-time in asset management vs. other industries. So what you end up with is an industry with (IMO) a fairly bad secular outlook both for volume and pricing, yet still very high demand, leading to high competition for positions. This all is simple enough, and perhaps I overdid the analysis. But it nicely frames why, more than ever, “pedigree” is a very easy heuristic for prospective employers (/allocators) to use. As one of my friends puts it, giving someone your money takes a lot of trust – and whether or not it’s fair or deserved, a wide body of behavioral science (Cialdini is probably a good reference here, perhaps also Thaler) demonstrates that we use heuristics whenever possible, and one of those heuristics is associating credibility with a uniform, a reputation, an image, a certification. Think about it. If the person who was ACTUALLY the best surgeon in the world showed up to operate on you with unkempt facial hair, sweaty armpits, a rusty-looking scalpel, and the OR turned out to be an event tent in the middle of a rainforest with a single flickering halogen bulb, wouldn’t you have second thoughts? Conversely, what do they call the person who graduated last in their class in medical school, when they’re wearing scrubs in a clean medical facility? “Doctor.” Similarly, many consulting and legal firms hire associates predominantly from Ivy Leagues not necessarily because they’re any better than equivalently-talented candidates from other schools, but rather because it makes their clients feel better to know that they’ve got Mr. Harvard and Ms. Princeton solving their problem instead of Mr. Aggie and Ms. West Nowhereville Technical. So, faced with the challenges that the industry faces, and the high ratio of applicants-to-available-jobs, it’s understandable (if regrettable, for intuitive reasons) that prospective employers prioritize easily-screenable metrics like where you went to school or whether you know someone who they trust. And this doesn’t apply just to getting a job as an analyst, mind you, but also to launching your own shop (if that is something you decide to do, the advisability of which is a whole separate discussion but loosely tracks my advice for people looking to enter this industry – i.e. don’t do it for the money because whatever you think the money is down the road, it’s probably an order of magnitude lower.) I’ve scraped and struggled my way to a low-single-digit ($MM) level of FPAUM after ~11 months of being able to accept outside capital, whereas you could find plenty of people, today or historically, in the business with comparable quality experience / resume who – by virtue of family or other connections – have low to mid eight figures of AUM the day they start. It’s just part of the terrain that you have to accept if you want to play. Relative to something like investment banking or consulting, the recruiting process for funds is less standardized (for both employers and students) because most funds don’t really have the scale to have someone (or a department) dedicated full-time to bringing in potential analysts. This means a reliance on either a small number of “target” schools, recruiters (who default to finding the most palatable, most easily located individuals) or relationships (I get at least one email a quarter from someone I know looking for an analyst). Becoming an analyst takes time and effort; it’s usually several years between the first time you (seriously) pick up a 10-K and the first time everything “clicks” and you’re able to, without direction, produce meaningfully useful investment research. This is required even more than it used to be because technology has made the “data gathering” element of an analyst’s job much quicker and easier – there are even plenty of sites and tools that offer pre-built, templated models where you can just tweak forecasts and see what you come up with – meaning the value-add is now more in the higher-level conceptual understanding, which takes time to develop. In-class opportunities for beginning to understand qualitative business logic – this is very rarely taught outside of “case study” like classes, which aren’t often offered at the undergraduate level. Extracurricular opportunities with guidance – such as case competitions, etc. In total, these factors usually combine to make the average graduate from a “target school” more prepared and well-rounded, even if they aren’t any more talented or technically competent. did I mention investment research by actual investors? Somewhere along the way, you need to figure out a draft investment philosophy – obviously this should be subject to change over time, but the world is simply too big for you to do everything at once. The what isn’t exactly so important as just having one that’s coherent and workable. Figure out what kind of situations make sense in the context of your resources, personality, and skillset. Pro tip: at least at the beginning, it’s usually best/easiest to eliminate as many variables as possible, so you can focus on improving skills and get useful feedback. For example, if you do a lot of research on cyclical, commodity-sensitive stocks, it’s hard to know whether you got things right or wrong because so much depends on the price of the commodity – whereas if you’re researching something like a cereal or SaaS company, on the other hand, it’s easier to disaggregate unanticipated macro events from company fundamentals. Of course, reading isn’t sufficient; in theory practice and theory are the same; in practice, well, you get the aphorism. 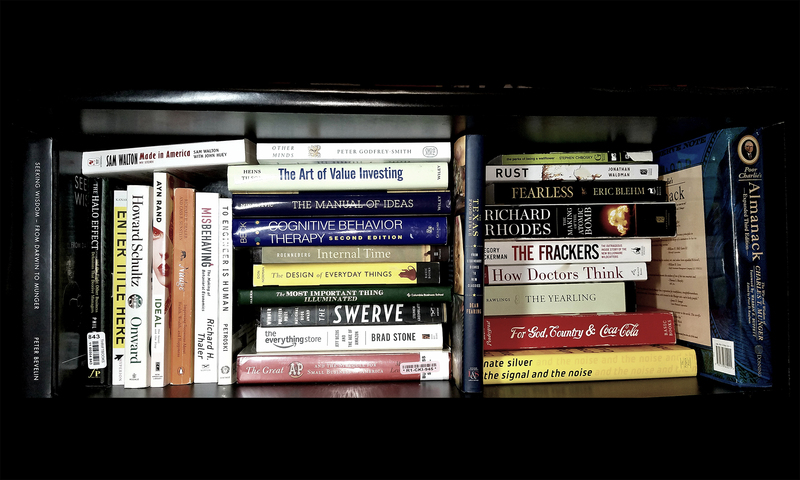 There’s usually a huge gap between grasping the theory (easy) and applying it (hard); there are many people I know – some are even professional investors – who can talk a great game and say all the right things, but don’t know what they’re doing when it comes down to researching a stock. Obviously this is challenging and there’s less practical instruction here in books and blogs than there is on the theory. Of course, there are paid courses, some of which are good: my favorite is my friend Todd’s Invest Like The Street Program (which focuses more on practical investing concepts than BIWS/WSO, which basically just focus on modeling). But for autodidacts – or those on a budget – there’s a lot you can do yourself, too. Rather than starting from scratch, it’s usually easiest to find investors whose philosophies you align with, and look at their actual research that they’ve published (whether on sites like VIC/SumZero/Seeking Alpha, in their investor letters or on their websites, at conferences like Sohn, in interviews with Bloomberg or CNBC, etc). Do the work yourself to recreate their logic… do you agree? Disagree? Why or why not? Would you put your own money into this idea? This helps focus your research on the relevant issues and avoids the “regurgitate the 10-K and build a detailed but useless model” problem that plagues a lot of student research. What’s even better than mirroring investors’ current ideas is using past ideas as case studies. Did it go really right? Really wrong? The latter is often more interesting. Would you have come to the same conclusions with data available at the time? What happened since then? What analytical techniques can you add to your toolkit for future use? Once you have something on paper, if you don’t directly have people to share it with, you can publish it on Seeking Alpha for feedback (pseudonyms can be used if you’re concerned about what people will think in 5 years). It’s important to get into the cycle of doing real investment research, seeing whether your conclusions turn out to be right or not, and learning over time what matters and what doesn’t. Remember, research needs to have a point and actionable insight – not just be a collection of facts that the PM could’ve found himself. Keep asking yourself why does this matter? Go back over old projects from time to time to a) note improvement and pat yourself on the back, and b) see what you got right, what you got wrong, and what you could improve on going forward. As referenced many times, this is still a highly relationship-driven business, and having people who can vouch for you (and mentor you) will go a long way. Luckily, the internet and the rise of social media makes it easier than ever to identify and reach out to people who seem to share your ideas. Obviously you’re more likely to get responses from people who are smaller or earlier on in their career, but that’s doesn’t mean you should totally write off bigshots either – I know a college student who got in touch with Clayton Christensen and a fund manager who occasionally corresponds with Howard Marks, for example. Don’t spam, but it never hurts to try, particularly if you truly have an affinity for what someone does. This isn’t exactly new news, but e-mails that show you’ve done your work and know who you’re talking to are more likely to get a response. Particularly in the era of social media, it’s not hard to figure out the basics about somebody’s approach, interests, holdings, etc; not doing at least that much background reading (when you want someone’s help) is likely to be perceived as lazy. Moreover, if someone just says hey, I want to be a value investor, help me, not only may I not feel like responding, but I also won’t really know where to take the conversation from there – and it shouldn’t be my job. On the other hand, if you ask an interesting and personalized question like “hey Samir, I noticed that you were bullish on Fogo de Chao as of last year, and I was curious what you think about T.H. Lee selling part of their stake at a lower valuation than they did two years ago at the IPO.” – then you’re more likely to get a response and start an interesting conversation. Additionally, don’t just go for fund managers or people who work at major funds – some of the more interesting people I know are off-the-beaten-path former analysts or even just individual investors – anyone with interesting ideas is worth getting to know; focus on the knowledge and the opportunities will come. Finally, and I can’t stress this one enough: show up for heaven’s sake. What do I mean by that? Well, my friend Clayton likes to tell the story of how, almost a decade ago, he was working a couple dead-end jobs when he met a guy at the YMCA (we’ll call him Joe, because that’s his name) who turned out to be a financially successful local businessman who offered to mentor Clayton and his roommate. Clayton showed up every time Joe called… Clayton’s roommate didn’t (and it’s not like he had anything better to do). Fastforward to the present, and Clayton ended up with an MBA and has branched out on his own as an entrepreneur after figuring out the corporate world isn’t for him. His roommate, well, who knows? I do know, however, that Joe’s offered to mentor plenty of other people who could’ve benefited from it… and none took him up to the extent that Clayton did. And the same goes for me, both as a mentor and a mentee: when I started out, I collected mentors like state quarters; I wanted to catch them all (okay I’m mixing my metaphors here), and I engaged with them as deeply as I could, and it was huge because different ones played different roles at different points during my development. I still seek out mentors today. On the other hand, I get people asking me for mentorship all the time, and sometimes I just offer it apropos of nothing to people who I find and like. Some people take me up on it… and others don’t. It’s very strange to me that someone would reach out asking for guidance, and we go back and forth and I offer a concrete and personalized action plan at meaningful expenditure of time and no personal benefit to myself other than the intellectual/emotional rewards, and then they vanish never to be heard from again. Don’t do that! 2: Figure Out Acceptable Trade-Offs. This is really broader career/life advice, but: you need to start stack-ranking your priorities. It would be awesome if everyone could have a first job where there was a great corporate culture, tremendous learning/advancement opportunities, a breathtaking, yuppie-friendly location, and a salary that makes your i-banking buddies jealous. Of course, out here in the real world, most opportunities look nothing like that. All that’s available might be an unpaid internship in a dilapidated office in the middle of some really boring town. What are you willing to give up to get the two or three things you actually really want? Trade-offs take broader forms too: is it more valuable to get a couple B+s instead of As if it gives you the incremental time to study things that actually matter? Are you willing to sacrifice the short-term and potential long-term benefits of establishing deep friendships to further your career? (In hindsight, I did that to far too great an extent.) Does your role have to be in public equities, or are you open to anything where you get to apply the philosophy? Is there a way to get closer to where you want to be, if not all the way to where you want to be? Etc. Get creative with your perspectives – often times people only look at things from one angle and miss out on a lot of opportunities because they look a little different than expected. Ex: newsletters, family offices, etc. It seems like there are one of two paths that most kids with a non-traditional background take: they either despair because it’s so hard, or they get a big chip on their shoulder that makes them untouchable to prospective employers. Look, I get it. I really do. I had the same issues as a biochem undergrad trying to secure business-related internships: the whole reason I got into writing for Seeking Alpha back when I was 18 is I went something like 0-for-20 on summer internship opportunities despite a 4.0 GPA. It can be frustrating. But eventually you’ll find someone who’ll listen; one dirty little secret of adult life is that tons of people end up doing stuff that has nothing to do with their formal education whatsoever. It’s just an issue of finding those people, and then being able to tell your story effectively. To that end, packaging is really important, and by that I don’t mean your clothes and haircut so much as I mean the way you describe who you are and what you’re looking for. Unfortunately, that can often be as (or more) important than content, particularly when you’re trying to make a first impression over the internet – if it weren’t important, do you think clickbait would exist? On that note… we’ll end where we started. No, I don’t wanna hear it. No, it’s more than I accept. ’cause I don’t care where I belong no more. No, it’s not a sin. *um yeah I may have spent a little too much time playing Tony Hawk and fantasizing about being an actual rebel kid instead of a overly studious poser and um no I’m not going to tell you exactly how recent that phase was but we’ll peg it at sometime between t minus 2 and t minus 5 years from the present day mmkay?